A typical house buyer always turns on not only with the exterior of the house but also when they feel at home upon entering the door of the house. No one will buy a house which looks creepy, dusty and monotonous like there has no life inside. So, if you are the seller and wanted to put up your house on sale quickly there is a rapid way of doing it and it is by repainting the exterior and interior of your house. Repainting a house would increase its market value and the good news is the amount of money you will discharge from your pocket could be returned up to 75%. If the exterior painting of the house is really bad, has an old coating and dreary a negative impression will likely to occur and the buyer might back off from considering the interior. But, if the exterior of the house is repainted, alive and the colors are inviting it is more likely that the buyer will get keyed up to enter the house and verify its interior. So, what is the great color scheme for exteriors? Usually, conservative colors like blue, green, chocolate, white, gray and different hues of it are the best paint colors to be applied on the exteriors because they are homey, soothing and always complementing. Further, a good paint job will make the interior looks new, thus, more profitable. 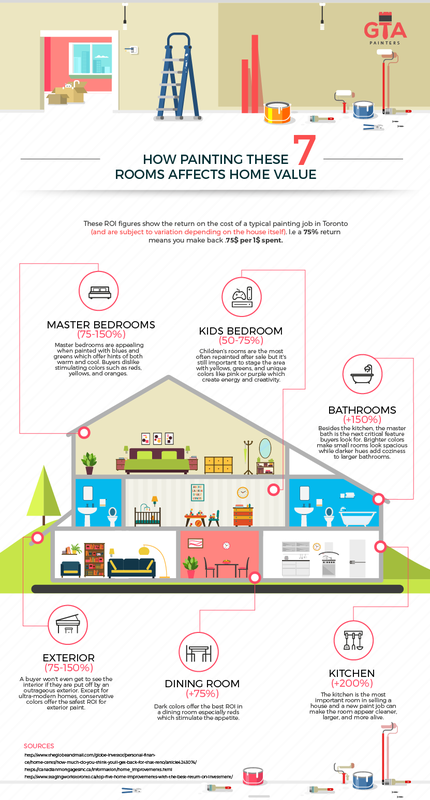 Check out this infographic to get some ideas about interior home painting.